The issue of new Lest We Forget Poppy stamps on 23 October, was first reported in the Royal Mail Philatelic Bulletin for September but had not at that time been mentioned by any other source, to collectors or dealers. This was the subject of an earlier blog post which I unfortunately mis-edited wiping out all the content but keeping the comments! Apologies for that, here is the image, and the original comments are in their usual place. More than likely this is just a mis-worded announcement of the annual re-issue of the previous Poppy stamps in their usual triplet format, which we have already been told would happen each year. The Philatelic Bulletin hasn't been that brilliant on the smaller details of late. Of course I could be wrong.... but there has been nothing in key account info - we will see. Agreed. I haven't been back long enough yet to take this up with TH. Ooo nice stamps definitive sized! Just the one design or would the other 2 Lest We Forget ones be available too? Interesting. Was the announcement accompanied by the definitive-sized mock-up above? I don't get The Philatelic Bulletin. Thanks. No, and that's not so much a mock-up as taken from the original 2010 publicity image on our website at www.norphil.co.uk/2010/01a-new_smilers_ms.htm So IF it is definitive-size, it should look like this. Thanks for clarifying. 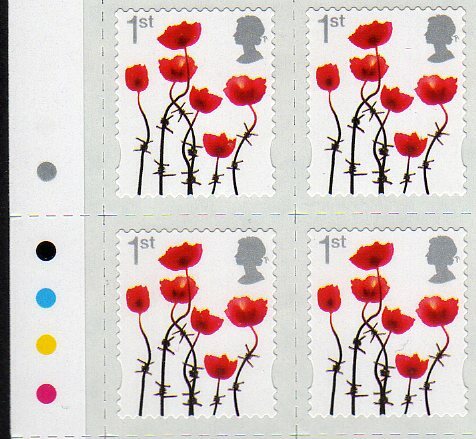 I forgot there was a poppy stamp in that 2010 set. So far it's only been used in the MS, the associated generic Smiler Sheet, and in Business Smiler sheets, as it wasn't for personalised Smiler sheets. This is why I think it will be self-adhesive, because they have probably not got enough of the previous (3-poppy) issue to use this year, and the preference is for sheets of 25 self-adhesives. That makes sense. There definitely seems to be step towards producing more self-adhesive stamps by the Royal Mail; at least for non-commemorative releases. I can't remember the last time I saw a gummed stamp here in the U.S. commemorative or otherwise. See update added today - this stamp will not be on automatic distribution from Tallents House, apparently. Do any post offices have these on sale? tried all my local ones and they don't know anything about them. Had to show them pictures taken from your web site to convince them that they exist! Any idea if there are still 'philatelic counters' at any branches? Should be in all branches, Doug. The village sub-PO that I use has them I think. My local PO had it yesterday (the issue date). It is presented as a sheet of 50 self-adhesives with 2 groups of 5x5 separated by a horizontal guttter. The stamps are the same design as on the 2010 gummed Business/Consumer mini sheet and self-adhesive 'For all occasions' generic Smilers sheet (which is why RM does not consider it to be 'new' and therefore has not sent it out to Regular Order customers). The traffic lights (see picture above) are at top left rows 2/3, and the cylinder numbers bottom left rows 8/9 (with the cylinder locator grid at row 10). Top right has a barcode and issue description 'NVIF POPPY', and 'Sale Date 23-Oct-2012' is at bottom right. The sheet is larger than A4, which gives me a problem of presentation - it would be lovely (if extravagant) to mount the entire sheet intact, but it's impractical. Maybe I'll just keep the cylinder block and use the rest for their intended purpose. my local office was told not to put reissued xmas stamps on sale on 23rd - so when is the issue date? According to the Philatelic Bulletin and all information we have been given, the Madonna and Child 1st & 2nd stamps should be made available from 23 October. Of course it is not an 'issue' date because it is a reissue and I suspect Royal Mail are not to concerned when Post Office branches start to sell them. I've also had a report of somebody at a home counties PO refusing to sell the Poppy stamp (from a part sheet, so it had been split and some may already have been sold) despite being shown the marginal marking that showed the sale date as 23 October! Carjam. Ref the poppy issue, RM did not let collectors know, because, they felt it was not deemed as a new issue?? But, has anyone notice that the 1st is on the top left and not bottom right, as in the 2006/07/08 issue. Cannot get the stamp, in any of our local POs, they have not seen them. Have ordered some from RM. See these other blog posts for details of why the stamps were not in your PO, and how to get them, which we published just after they were issued a month ago.